If we were wearing red on February 5th, chances are that you already know February is American Heart Month. For its part, the slogan this year for the Centers for Disease Control and Prevention is “Make blood pressure control your goal.” The aim is to prevent a million heart attacks and strokes in the US by 2017. High blood pressure(BP), or hypertension, affects some 70 million Americans, quadrupling the chance of a person dying from a stroke and tripling the chance of dying from heart disease. Physicians prescribe medications to lower BP but with limited effect. Some people do not see the benefit, some may suffer unwanted side effects and others may hear stories about adverse effects that cause them to discontinue treatment, as previously reported by Medical News Today. For many, it may be that the treatment is not targeting the underlying cause. Hypertension that results from a medical condition, such asobstructive sleep apnea, adrenal gland tumors or thyroid problems, is called secondary hypertension. This type of high BP can result from medications such as hormone treatments and painkillers, recreational drugs and even herbal remedies. Secondary hypertension usually starts suddenly and causes higher blood pressure than primary hypertension. Over 90% of people with high blood pressure have primary hypertension. It progresses gradually over the years, increases with age and is affected by hereditary factors. Lifestyle factors, such as too much salt, lack of exercise, obesity or heavy alcohol consumption can cause primary hypertension. While advice and treatment for high BP mainly focuses on lifestyle factors or dysfunction of the cardiovascular system, some researchers are looking elsewhere. This spotlight will touch on some new approaches to hypertension. Prof. Julian Paton and colleagues, from Bristol University in the UK, are among researchers studying the relationship between high BP and the brain, and particularly the nerves in the brainstem. To understand the role of the nervous system in blood flow, we will start by looking at the autonomic and sympathetic nervous systems. Some of our actions, we control; we choose to raise our hands or close our eyes. But we cannot normally choose to breathe or to stop our heart from beating. It is the autonomic nervous system that controls involuntary actions such as cardiovascular system function. The autonomic nervous system includes the sympathetic nervous system. When we are stressed, the sympathetic nervous system, sometimes called “fight or flight,” steps in. The adrenal glands produce more of the neurotransmitters epinephrine (adrenaline) and norepinephrine (noradrenaline), and extra blood is pumped to the muscles, which delivers additional nutrients and oxygen until the crisis is over. “Neurogenic hypertension is related to excessive and abnormally high sympathetic activity,” he added. The additional activity is normally temporary. If it continues, it can become a problem. 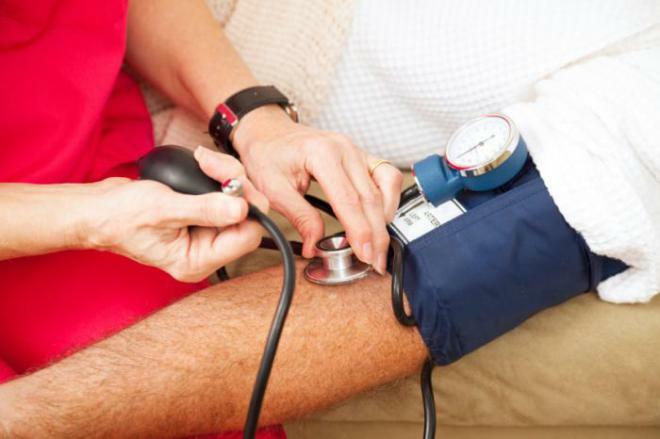 Researchers have previously associated stress with long-term hypertension. MNT recently reported that teenagers who are easily stressed are more at risk of hypertension later in life. In 2014, Mancia and co-researchers, from the University of Milan in Italy, found abnormally high amounts of norepinephrine and epinephrine in people with normal blood pressure but whose families had a history of hypertension. These “sympathetic bursts” have also been seen in patients with high BP. Mancia’s team concluded that high BP can result from a dysfunction in the autonomic nervous system. They propose that a “central sympathetic overdrive” is responsible for hypertension in some people, depending on their genetic background or blood pressure phenotype. The kidneys are key to the cardiovascular system because they regulate the balance of salts and fluid, which has a direct effect on BP. If the kidneys lack blood, they can call on the brain for provisions. The brain supplies the kidneys, but this will cause an imbalance, because the brain will be short of blood. Hypertension will occur. The term “selfish brain” was coined by Prof. Achim Peters of Lübeck University in Germany, a specialist in obesity. The hypothesis perceives the brain as having “a special hierarchical position” in the body. If there is a bottleneck, so that the brain cannot get enough energy, says Prof. Peters, it will call the energy back to itself. Research has shown that many patients with hypertension have narrow blood vessels at the base of the brain and low blood flow, also called high resistance. Some scientists are now speculating that low blood flow in the brainstem may cause systemic hypertension in order to boost blood flow to the brain. If blood flow to the brain decreases, the brain will send out instructions to the body to constrict blood vessels, boosting the blood supply to the brain but resulting in high BP. In hypertension, the sympathetic nerve signals to the blood vessels makes them stiff, their walls become thicker and resistance increases; if this happens in arteries to the head, it makes it harder for blood to reach the brain. Prof. Paton’s team is seeking to better understand what causes this to happen. The question is: does reduced blood flow to the brain cause hypertension, as is generally believed, or does hypertension decrease the brain’s blood supply? The Bristol team believes that finding out what causes the resistance could lead to solutions to reduce the restriction, in order to normalize BP. One solution proposed by Prof. Paton and others in 2012 relates to the carotid body (CB), which is attached to the carotid artery. The carotid artery supplies blood to the brain and the carotid body acts to ensure the brain gets enough oxygen. The CB is a cluster of chemoreceptors or sensors, which constitute the main peripheral chemoreceptor in humans. CB hyperactivity is known to increase neurogenic activity and, therefore, vascular resistance and hypertension. Prof. Paton told us that his team has found that these sensors are sending alarm signals to the brain to put blood pressure up, for some unknown reason. Normally, he says, these alarm signals are off. If suppressing the activity of the CB can improve blood pressure, removing or suspending functionality could help control hypertension in people with an autonomic imbalance, and start to uncover the root cause of some kinds of hypertension. Prof. Paton told us that targeting the brain is difficult because it can lead to serious side effects. However, he added that the trick will be to find a drug that targets the peripheral nerves controlling blood pressure. This may have limited side effects and would be the first new anti-hypertensive drug in 15 years. We asked if he thinks researchers have been barking up the wrong tree all this time. The wrong approach, he adds, leads to poorly targeted drugs and low adherence to medication regimes. Prof. Paton believes that if the current theory is right, any therapy that results could help many patients with primary hypertension by targeting their conditions more precisely.